Esquire's best chef of the year, Chef Domique Crenn, poses for a photo. We like our food in the Bay Area and we are spoiled with a plethora of fabulous restaurants to choose from. And the world has once again recognized our culinary greatness. Both the greatest chef and the greatest hostess come from our fair land, sort of anyway. They are both originally from France but whose checking? They work here now. 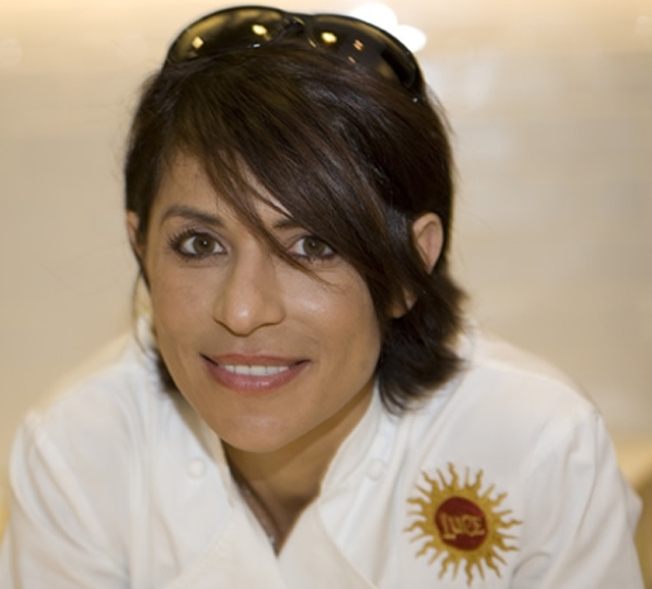 Chef Dominique Crenn was raised in Versailles, France but now she plys her trade as the head chef at Luce in the Inter Continental Hotel on Howard Street. Esquire did a lovely write up of Ms. Creen that made our mouth water. Now as if having the greatest chef in our mitts was not enough, we are also blessed with the world's greatest hostess, okay maybe just the country's greatest hostess but whose checking. Esquire chose her as the greatest hostess for her charm, good French looks and her ability to deliver a good plate of food. Biaz is a hostess at Chez Papa Resto in San Francisco. What does she plan to do now that she is hostess of the year? Mail her mom a copy of the award of course. Check out her lovely interview (and photo) with Esquire magazine.